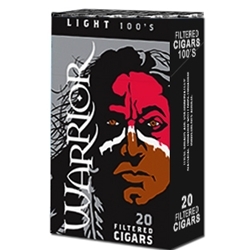 Warrior Light Filtered Cigars are available in Box 100's and packaged 20 cigars per pack, 10 packs to a carton for a total of 200 premium filtered cigars. Warrior Filtered Cigars are Seneca Manufacturing Company's third line of filtered cigar, designed to honor SMC's Native American tradition. The Warrior image represents bravery, strength, and an unwavering commitment to persist through adversity.